A curious young girl’s encounter with insects and her realization of the similarities between busy adults and busy bees. 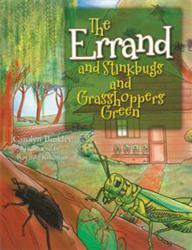 In The Errand and Stinkbugs and Grasshoppers Green, author Carolyn Binkley tells a rhyming story about a curious, yet clumsy young girl who runs an errand for her mom. Set in rural surroundings, she is sent to a neighbor’s house and encounters a family of stinkbugs, a bumblebee, a katydid, a grasshopper and a swarm of honeybees along the way. At the end of the story, she realizes how grownups, distracted by responsibilities, often seem not to notice the presence of these amazing creatures. This simple children’s story takes readers on a journey with a distractible young girl whose curiosity and fascination with insects leads her to discover their charming, alluring, and appealing characteristics. Filled with colorful illustrations and whimsical rhyme, The Errand and Stinkbugs and Grasshoppers Green is an adventure story that will allow readers to see these small creatures through the eyes of a child. The book includes some interesting insect facts, allowing readers to become aware of the importance of insects in the entire ecosystem. This book, soon available in audio version as well, will be featured at the 2012 New Jersey Library Association Book Exhibit in Atlantic City, N.J. on June 5-6, 2012. The Errand and Stinkbugs and Grasshoppers Green details a young girl’s distractions with insects as she journeys through her neighbor’s yard on an errand. Writing this story, Carolyn was reminded of her own adventurous childhood and her life-long curiosity of creatures, great and small. To request a complimentary paperback review copy, contact the publisher at (888) 795-4274 x. 7879. To purchase copies of the book for resale, please fax Xlibris at (610) 915-0294 or call (888) 795-4274 x. 7879. For more information, contact Xlibris at (888) 795-4274 or on the web at http://www.Xlibris.com.